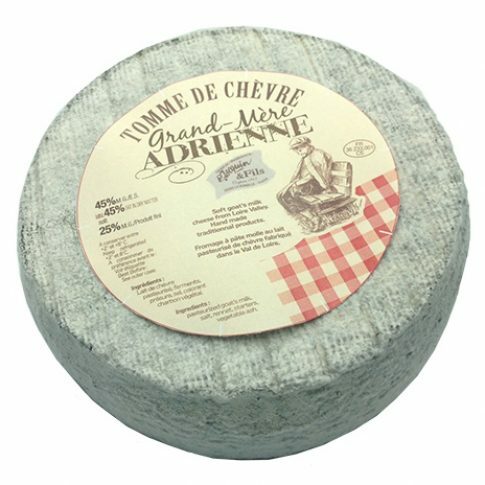 Tomme Chévre Grandmère Adrienne - Zuercher & Co. Located in the Centre-Val de Loire, Fromagerie Pascal Jacquin et Fils has specialized in making and aging the region’s traditional and exemplary goat’s milk cheeses since 1947. This fairy tale region is a land known for its majestic castles, wildlife, fishing, Sauvignon and Chenin Blanc-rich vineyards and, of course, goat’s milk delicacies. Fromagerie Jacquin is currently managed by two generations of the Jacquin family. Working on the manufacturing side is Pascal and his brother Christian. Pascal’s son, Romain, handles the sales department. Their cheeses are based on the centuries-old recipes and production knowledge passed down throughout generations in the Loire Valley. Their expertise is in hand-ladled molding and traditional affinage. Fresh milk is collected daily within a thirty mile radius of Fromagerie Jacquin from fifty local farms whose average herd is about 150 goats. All of the cheeses made for the US market use the same milk, recipe and craft as used for the French market, but are pasteurized to appease governmental regulations. “Grandmother Adrienne” is a beautifully bloomed goat cheese. It has a fudgy texture towards the center and a runny, melted ice cream consistency near the rind. Tomme de Chèvre Grand-Mère Adrienne displays flavors of buttermilk, lemon and faint minerality, and is an elegant addition to a cheese course or simple meal with a fresh salad, bread and white wine or wheat beer.